I only wore the shirt for a couple of hours yesterday so I really didn't see any reason why I couldn't wear it again today. It's not one of those non-iron ones so I was going to wear it again before it got washed anyway. Certainly before it got ironed again. 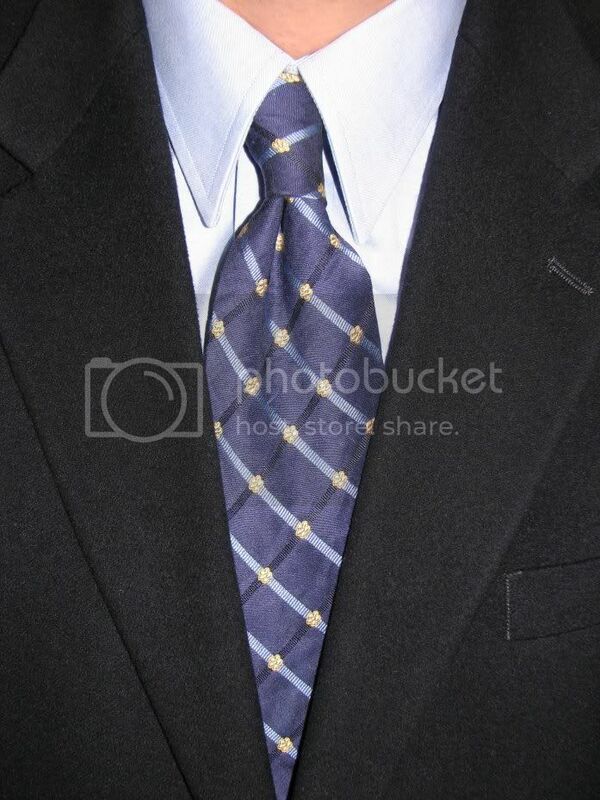 The necktie is another Jos A Bank Signature from Ebay. It's only 50% silk with the other half comprised of linen. It wrinkles quite easily and ties a very uncooperative knot. I think I might stick to 100% silk from now on. Of course it could be the liner, I guess. The design is a bit of a windowpane (I'm in a windowpane rut lately) with small flowery things where the lines cross. I'll give you three guesses which coat I selected and the first two don't count. Yes, the navy sportcoat.